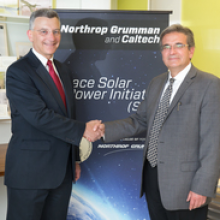 Northrop Grumman recently signed a 3-year, $17.5 million sponsored research agreement with Caltech for the Space Solar Power Initiative (SSPI) project. Professors Harry Atwater, Sergio Pellegrino, and Ali Hajimiri serve as the project’s three principal investigators and plan to build out a team of 50 researchers. The SSPI project aims to solve the renewable energy challenge by producing a cost-efficient source of solar energy. The project has three target research areas: high-efficiency ultralight photovoltaics; ultralight deployable space structures; and phased array and power transmission. Read the NGC press release here.